The division landed on Omaha and Utah Beaches, 13-14 August 1944, and drove through Nogent-le-Rotrou in an attack on Chartres. The city fell on 18 August. From Chartres the division advanced to capture Dreux, Melun, and Chateau-Thierry, crossing the Seine River, 24 August, and pushed on to take Verdun, 31 August. The 7th halted briefly for refueling and then drove on towards the Moselle near Dornot. The division was repulsed in its attacks across the Seille River. The 7th then shifted to Holland, where on 30 September it joined in offensive operations expanding the British-American Market-Garden salient, thus also protecting British-Canadian drive to clear the northern and western approaches to Antwerp. After resting in mid November, the Division returned to the front near Linnich, Germany, on the banks of the Roer. It was preparing to drive into Germany when the German winter offensive began on 16 December 1944. The Division was ordered to St. Vith where it absorbed much of the weight of the German drive and was forced to withdraw west of the Salm River, 23 December. It shifted to Manhay, Belgium, and by the end of December had cleared the town of the enemy. After a brief rest in early January 1945, the Division returned to positions near St. Vith, attacked, and captured the town. In February 1945, Combat Command R was attached to 78th Infantry Division for attacks on Strauch, Simmerath, Steckenborn, and other towns in the area of the Huertgen Forest, while the rest of the Division rested and reorganized. In late February and early March 1945, the Division moved up to hold defensive positions along the west bank of the Rhine, south of Bonn to Unkelbach, with the anti-aircraft battalion at Remagen protecting the bridges. The 7th returned to the offensive on 26 March, breaking out of the Remagen bridgehead, and took part in the encirclement and reduction of the Ruhr Pocket. On 16 April the LIII German Panzer Corps surrendered to the Division, and the eastern sector of the pocket collapsed. The Division then swept north to the Baltic Sea, effecting a junction with the Russians shortly before the war in Europe ended. 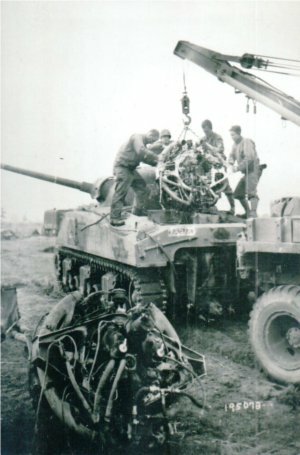 The nickname "Lucky Seventh" of the Seventh Armored Division is attributed to a remark made by Major General Alvin C. Gillem, commander of II Armor Corps who said "the Seventh Armored Division is lucky to have trained with the Third Armored Division and is lucky to have the man it does as its commander general".